How underused is the slow-cooker? This little cooker is a time-saving, budget friendly, flavour building mean lean machine! 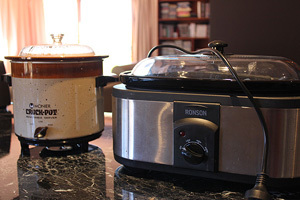 If you don’t own a slow cooker (Crockpot) you may want to seriously consider purchasing one. My mother used to use a Crockpot and passed it on to me years ago. It sat in the back of the cupboard neglected until I was reminded of it one day. At the time I was working late in a retail business I owned. My children would be dropped off after school and have to wait until we got home to be fed. The shop kept us there until 7pm or later some nights and I would then have to deal with making dinner. I started taking my slow cooker to work and making dinner in the back of the shop in the morning. When the kids were hungry I could feed them straight away and take the cooked dinner home hot, ready to serve my late husband and I as soon as we got in the door. I continued to use it after discovering that the flavours of soups were much better than cooked on the stove top. Now I make low-calorie dishes that my young step-children enjoy too. I have a small old Crockpot and a newer 5.5 litre that I inherited when I married my amazing man. I use them both regularly. They do hold more in grams than the litres stated. The small 2 Litre will make 3 kilos of food 5.5 litre will exceed that amount in grams. Although many different meals can be made in a slow cooker, soup is the main staple I make. Soup definitely tastes differently when cooked slowly. A slow cooker brings out all the flavour of the ingredients and you need less added flavouring as a result. Just combine you favourite vegies, a few herbs and a bit of natural stock and cover with water – easy! It is endless the amount of low-fat, low-calorie recipes you can whip up in a slow-cooker.